Another fantastic book! Action, adventure, humor, and most of all..cryptids. A few more pop culture references (Monk, Jed Clampett, and Jeff Goldblum) in this one than in past ENIGMA books, but I liked that. Also interesting to see Jack start to find religion (but when one is staring down a twelve foot tall cryptid, who wouldn't find God?). Can't wait to see what monster is next for Jack and his investigative team!Now waiting for the next book from one of my favorite authors, J. Kent Holloway! I anxiously awaited this installment of the Enigma series with Jack, and absolutely enjoyed the story...A good book for me makes me want to stay up late and read (which I did last night), even if I have to work and should really be sleeping. The lost hours of sleep were well worth it for me after finishing the book.SPOILERS!!! !Jack heads to New York because his old friend was attached by what people are calling the Jersey Devil. His old friend is a tracker/hunter and Jacks dad taught him all he knew. Jack unofficially stars looking for this cryptid and of course, things go south fast, and his team comes to help him, and we get to meet Jack's dad who is helping them, even though Enigma had not opened an official investigation.Jack and the team have several run ins with the local police, a senator and his campaign, and chaos ensues, all in all a normal day in the life for Jack.During his investigation, he meets Mia Leeds, whose brother is Senator Leeds and is on campaign for reelection. 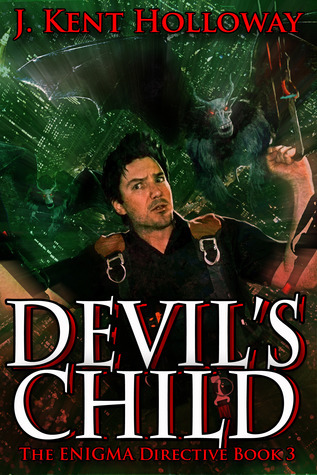 One of his opponents is attached by a Jersey Devil, and the investigation leads to him and his family.The "Devils" are looking for a baby and murdering at the whim of someone... the investigation takes them all over New York, getting into scrapes with the local police and Jack is injured himself (several times) which is normal for him. He just finds trouble.Jacks enemy "Freakshow" from Kent's short story featured in "The Game" makes an appearance and we get to see more of Arnold his pup in action (if you haven't read "The Game", you need to!! But if the entire collection isn't up your alley, you can pick up Kent's story as a standalone short as well. Definitely helps in this story if you read it first.Nikki and Jack start to reconcile their difference and there are some nice twists to the story and I think those of us who truly love this series will be shocked and enjoy it!! Some characters from other books make their appearances too, and it makes you want to read more and more!! Definitely looking forward to the next installment to see where this story goes. You won't be disappointed in this book.End spoilers!! :)I highly recommend this series and this particular story to all. If you like the Cryptid/paranormal type genre, you can't go wrong. The nice thing is this is ok for a younger teen to read, and my 14 yr old daughter is now following the series and my 11 yr old who reads voraciously too, and at a high reading level is starting the first book. J Kent Holloway is now on my list of favorite authors. wow, he sure can write a suspenseful action packed book.From the opening page until the end he just doesn't let go. Dr Obediah Jackson is in over his head on this one. He is visiting New York on a Hunt for the Jersey Devil. when he visits Central Park he is in for a huge surprise. Nothing is at it seems.There is a short story just before this book that I would suggest you read first. "Freakshow" has some character introductions that will help when reading this one. His Dog Arnold is not quite a real dog and the bad guy in this book is introduced. Another great addition to the series, once again Jack and his team find themselves in the middle of all the action and mystery, his sarcastic attitude and smart-mouth ways just make you continue to love him. I'm struggling to choose a favourite as each book has been excellent in it's own right. I cannot wait for the next instalment, I hope we don't have to long to wait. J. Kent Holloway - J. KENT HOLLOWAY is the international bestselling author of six paranormal thrillers and the first book in an epic fantasy trilogy called The Legend of the Winterking. He also co-writes Jeremy Robinson's 'Jack Sigler Continuum' series.Kent has just finished his first forensic crime thriller entitled CLEAN EXIT, and is currently working on selling it to a major publisher. With more than twenty years of experience as a forensic death investigator for two different Medical Examiner offices within the state of Florida, as well as several years of work as both a private investigator and as a newspaper reporter following the crime beat, he brings a unique and authentic perspective to the genre.Find Kent at his website: kenthollowayonline or by following him on Facebook.